We believe that each creation is a masterpiece and deserves to be taken care of with upmost care, thought and respect . 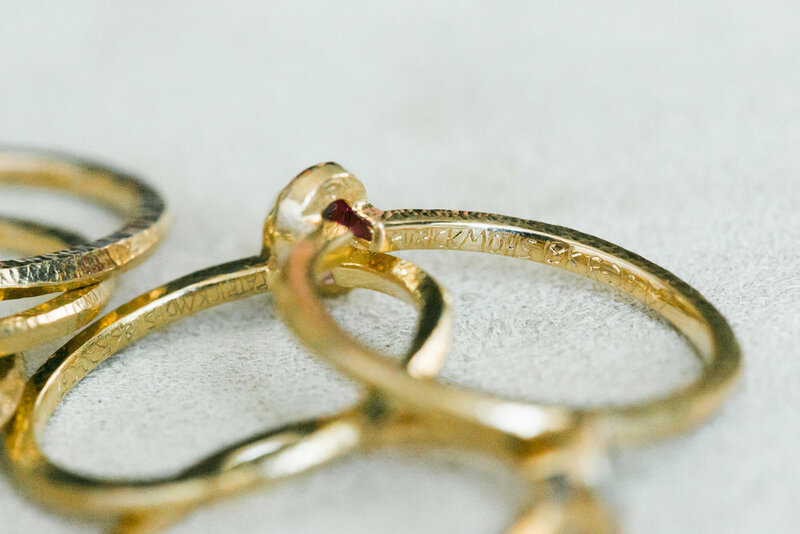 Using tools that are manually controlled we transform gold and gemstones into wearable works of art. Each piece of jewelry is born from the inspiration of the nature surrounding us. Like any great work of art, the journey of creation varies from piece to piece. Each design is brought to life one at a time with great attention to detail. We invite you to join us and explore the journey we take in bringing a piece of jewelry, our art, to life. From an idea and imagination to a finished piece we hold in awe. Here is a behind the scenes exploration of our jewelry design process combining traditional techniques like drawing, wax carving, soldering, hand fabricating, casting and gem setting along with modern techniques like CAD, modeling and laser welding. Our creative process starts with “Inspiration, Exploration, and Gem Selection”. We have an idea and explore the idea together visually with gems. Next we put our ideas on paper – drawing each design to perfect what we have in mind. Our sketchbook is like a flowing journal of ideas, concepts and designs we can always explore further or choose to bring to life. From our sketch book we take our designs to the next level by using CAD to perfect our vision. Next we create a wax model from the CAD image. The wax model is sprued to a base and a steel flask is fit over it. The steel flask is filled with liquid investment (similar to plaster of paris). After the investment hardens, the rubber base is removed and the flask is put into a kiln to burn out the wax creating a void that will be filled with molten gold. The flask is taken out of the kiln at 1000 degrees Fahrenheit and the gold is melted in a crucible with a torch and poured into the flask which is under vacuum pressure. The hot steel flask is quenched in water which unveils the gold casting from the investment – always a magical moment! A hand saw is used to separate the gold castings from the casting tree and button. Time for benchwork; from filing and sanding to soldering and hammering all the little steps that mean so much in creating a special piece of jewelry. Gems all fit by hand under a microscope using a rotary burr. Cutting gold away bit by bit until they the gem fits snugly and is ready to be set. Diamonds mapped out and set one by one under a microscope. Polishing and finishing details give each jewelry creation life and unique character. Finally, each of our jewelry pieces are hand signed. Also inscribed on each piece is a unique number, which is recorded in our archives. An idea, a design, a creation entirely brought to life in our studio. But the story never ends, who will wear this, where will it end up, where will it travel, what will it commemorate, will she say yes, will he say yes, will this be a family heirloom, who will smile and recall a special memory when they see it – now the story begins, with you.